In it’s 9th year, this is the first time Go Vertical has been held in Skydive Empuriabrava. With 100 registered jumpers and over 1800 jumps completed, it was another great success in this years programme of events. Organised by Tim Porter and using Jans’s famous Beech 99, the boogie was held over a week, starting on the Saturday. It’s a simple format, to give freeflyers similar airtime to flatflyers by giving 15000 feet on each load, all for a registration fee of 35 euros. Edited highlights of each days jumps were put on DVD by the time jumping finished, Excellently mixed by Anna and Matt, these were shown every night in the DZ bar, a great way to get the night rolling!! 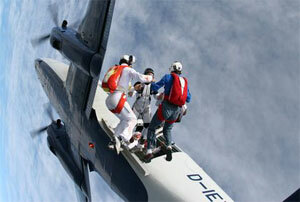 Plans are already in place for Skydive Empuriabrava 2006, watch this space!